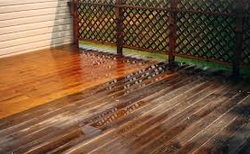 A clean wooden deck, is the safest wooden deck. When wood starts to get even a little green with dirt and algae, it will become very slippery and un-safe for everyone. Most people like to do their maintenance in the summer, when it's warm and dry, But it is in the fall and winter that most safety issues occur. Washing your walk-ways in spring or fall will help keep it safer and will reduce staining. We recommend a professional surface wash and application of protective coating or anti-slip treatment.